The size of small plums but oval in shape, the Marula fruit ripens to a rich yellow, with a tough outer skin surrounding its fibrous, white flesh. Containing four times more vitamin C than the average orange, Marula is a succulent fruit with a citrus tang and a creamy, nutty taste. Once the Marula fruit is perfectly sun-ripened, we gently hand-gather each one. First, the fruit is de-stoned, its flesh crushed and the pulp fermented. After fermentation, the Marula ‘wine’ is distilled and aged in French oak barrels for at least two years, during which wood spice characters of vanilla and toast are naturally imparted. 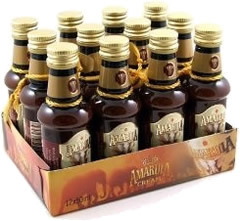 Thereafer dairy cream is infused to give Amarula its rich, velvety texture. Only then do we bottle this little piece of Africa. Amarula is best served over ice and preferably, with a view. Made for mixing, it's enjoyed over ice with soda, Appletiser, ginger ale, passion fruit or a host of other mixers. Consumers love its versaltility, an adventurous drink with a totally oiginal taste and compliments the 17% ABV It also appeals to consumers who dont generally drink cream products and creates an opportunity for them to experience a new expression of the distinctive and exotic taste of the Marula fruit! Details Amarula is a cream liqueur from South Africa. It is made with sugar, cream and the fruit of the African marula tree which is also locally called the Elephant tree or the Marriage Tree. METHOD: Fill a tall glass with crushed or blocks of ice. 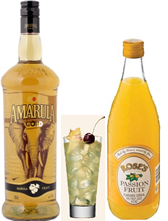 Add 25ml Amarula Gold along with 25ml Passion Fruit cordial. Using a swizzle stick, mix for a few seconds, garnish with passion fruit pulp and enjoy.